1) You open yourself up to a range of tools if the one you selected contains a feature that does not work for your specific use case (for example: sharing / privacy). 2) You begin to think more deeply about what you want to accomplish with the tool up front rather than modifying what may have been a good, effective learning activity to fit within the limitations a poorly matched tool (for example: I wanted small groups to be able to edit and build-upon the work of their peers in round three). 3) You can communicate your needs more effectively to an Instructional Technologist and perhaps a better tool can be located to meet your needs. 4) You can avoid using technology, or features of the poorly matched technology, for sake of integrating something new (and perhaps ineffective). 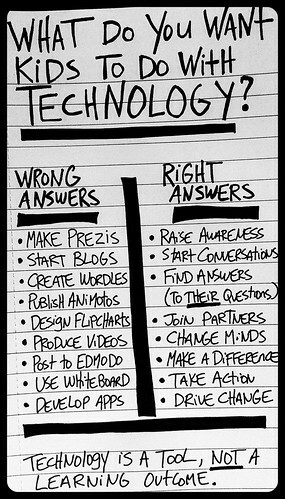 apps, classroom, Faculty, Flipped Classroom, online learning, teaching, technology. Bookmark.